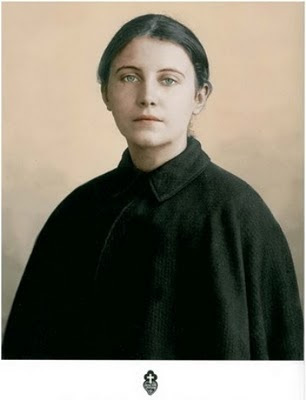 The devils war against St Gemma and his attempt to seperate her from her loved ones. Those who have read some of the life of Saint Gemma know of the frequent attacks of the devil upon the saint. With God’s permission, he launched countless attacks, both spiritual and physical, all in an effort to lead Gemma away from God, and her mission as victim soul for the salvation of souls. The word "Devil" literally means "Divider", and one of his goals is to sow division amongst all of humanity. “You will be trampled underfoot by the devils. Prepare yourself, my daughter, the demon at My orders will be the one that will add the last touch to my plan that I will accomplish in you, that is, your sanctification." (v. Biography G. Bonardi, 178) Even more [Jesus said to her]: "With my permission the demons will try continually to dishearten your soul". (Letters of St Gemma, 285). 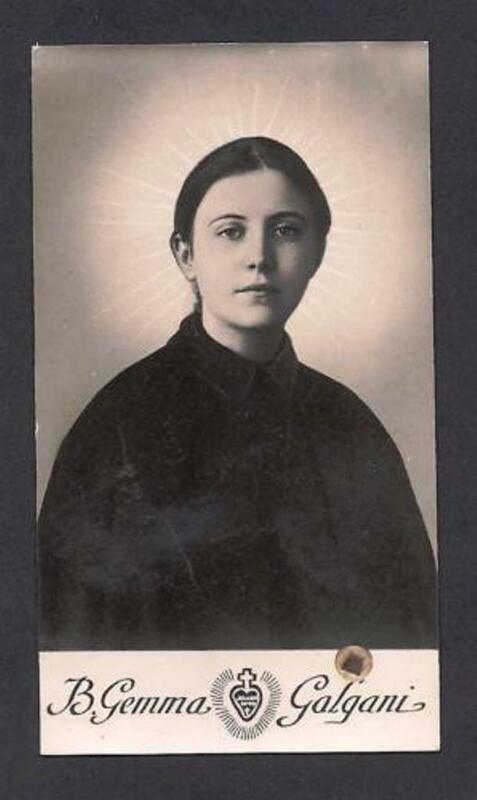 And the demon will be relentless with St Gemma: “He has repeatedly set himself against me" she wrote to her Passionist spiritual director, Fr. Germanus (v. Letter 71) . And in her letter to Mons. Volpi in December of 1899 Jesus says: "See how everyone in the world treats Me today? I am very much displeased with those who offend Me." I begged Jesus to have patience, and to satisfy His wrath on me; to make me suffer much more, because I seemed to have the strength. Jesus then told me that the demon henceforth would have even more power to attack me. At this point He said: "To make you understand more clearly that you will be a daughter of the Passion, I will have you submit to his attacks." (Letter to Mons. Volpi, Dec 1899). And many of her other letters and numerous witnesses attest to the relentless campaign of the devil against her. Full of lies and deceit, he began in 1898 with temptations by trying to befriend her, telling her he would cure her if only she would do as he said. Through the grace of God she saw through his deception and rebuked him, which then caused him to change his tactics. He then tried to disguise himself in various forms, on one occasion in the confessional as her confessor, on another occasion as her Angel, and on a third occasion as Jesus Himself, to mention only a few. 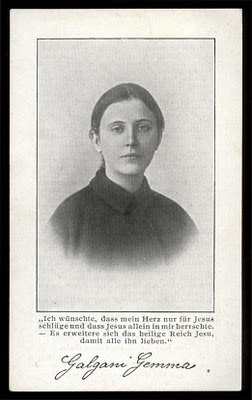 Jesus however soon taught her the means to distinguish heavenly apparitions from evil ones---at the first appearance of any vision she was to say “Blessed be Jesus and Mary”. If the vision repeated the salutation, she knew it was from God. If not, then she knew it was of demonic origin. At most the evil apparitions would say “Blessed be.” This rule of discernment given her by Jesus was to put and end to the devils masquerades. He then began open warfare. The devil (whom Gemma in her letters nicknamed “chiappino”, which in english is the equivelant of "theif") would appear to her in various hellish forms, in an effort to scare her and lead into despair. Often he appeared as a “small, very black, hairy man” who would beat her mercilessly, and he also appeared in this form once with serpent wrapped around his arm. At other times he appeared as a “large, black dog”. Again, other times he would appear as a “large black cat”- similar to a black panther. Father Germanus, Gemma's spiritual director, himself saw the devil in the form of a large black cat that ran into Gemma’s room, and jumped onto the foot of her bed on one occasion, not long before her death. Gemma, noticing his horror in response to the vision, said to him “Do not worry Father; he is here for me, not you.” Again other times he would try to attack her purity, by appearing in “a disgusting manner”, as she called it. Worn out from all the devils attacks, Gemma asked for exorcism not long before her death. Monsignor Volpi, who was her confessor since childhood, and was the auxiliary Bishop of Lucca--a very learned man in whom some churchmen of that time considered a saint, did not deem it necessary, but to placate and comfort Gemma a bit he decided to read some prayers (a simple exorcism?) After all, being her longtime confessor he knew that Gemma had always sought God with all her heart, and was in a state of grace, so surely he felt that an exorcism was not necessary, as her will was most certainly turned towards God, and not the devil. And by that time the attacks of the devil upon Gemma where nothing new to Monsignor Volpi, and he knew from experience how Gemma always triumphed over the attacks through prayer, and her love and trust in Jesus and the blessed Virgin. By then he knew that Gemma was posessed by God, and not the demons, and the only thing the devil could really do against her was to make her suffer---and this was something that the devil never seemed to tire in doing. The devils hellish campaign to villify Gemma and to separate her from her loved ones. As we can see, Gemma was made subject to the loathesome, atrocious and even brutal assaults of the demon. Moreover, by his hellish trickery the evil one sought in earnest to confuse the minds of her confessor, her spiritual director, her beloved "foster mom" Cecilia, and the rest of the Giannini family, so that all of her beloved friends would come to look upon her as a fraud and a hysteric. Sadly for Gemma, the evil, malignant campaign succeeded for awhile, in part, and Gemma suffered dearly because of it. We shall see the devils campaign to malign Gemma and sow division in the minds of her loved ones in the story of the letters below. The story begins with Gemma, having finished a letter to Father Germano one day, Gemma gave it to Cecelia to put at the shrine where the angel was accustomed to collect her letters for delivery. (For those unaware of these circumstances, Gemma would place her letters to her spiritual director in a little Child Jesus shrine box in the Giannini home, and her Angel would take the letters and place them on the desk of her spiritual director, Father Germano, who lived several hundred miles away in Rome -More info on these angelic letter deliveries here). Monsignor Volpi, it seems, wanted to once again test these “angelic deliveries” and requested that Cecilia give Gemma’s letters to him, so on this occasion, Cecelia did not place it in the Child Jesus shrine, like Gemma expected, but brought it to Monsignor Volpi, as he had requested. ... Do not be afraid, Father, the authentic letter is the one that you have in your hands. Do not give it to anyone; that is what Jesus wishes. But whatever happened after that letter was written, I do not know. Everybody since this affair treats me with severity. Before, they believed that there might be something good in me and showed great regard for me; now they think differently. Now there is left to me only Jesus, and Jesus alone. Monsignor is very much disturbed about the matter, so that he will hardly hear my confession. He says I am a liar as the devil is a liar; he tries to keep me from receiving Communion, and says if I continue to sin, he will forbid me to write to you. I refrain all I can from speaking of you in confession because Monsignor tells me that it is extraordinary that a priest like you would have believed me so readily and have succumbed thus to the devil. Nevertheless, let us thank Jesus together, Father, for this trial. Today after Communion I asked Jesus to explain the mystery to me somewhat, and he said: "Oh Daughter, now has come the time when your strength will be most cruelly tested, and I will give you whatever graces are necessary for you. Be calm, because I am always in your heart." Blessed be Jesus! How calm and content I should be if my flesh did not rebel, but I shall try to make it subject to the spirit. It is the devil who is at work in me. Yesterday he forbade me to give so much thought to Jesus, and tried to forbade me to go to Holy Communion, and to be like everybody else, and not care so much for Signora Cecelia; and now that poor aunt is so afraid that it is the work of the devil, that at night she does not come to see me any more; in the morning she leaves me alone and cares no more for me, saying to me at every word that I speak: "I do not wish to be deluded." Oh Father, this suffeing I had already foreseen; but what shall I do? If it were not for Mea, [one of the servants] I should be always alone. But then have I really deceived everyone? What will become of my soul? I think of my soul, at Communion, which Monsignor thinks is continually in the state of sin, I die of grief; grief for the great wrong that I may have done to Jesus. I do not wish to deceive anyone. Pardon me for saying it; but I don't think I deceive as Cecelia, Monsignor, and all the others believe. Help me, I want to be good, I want to obey. Don't keep me here any longer; put me in some place in Rome, near you; I die of sorrow, I don't want to sin any more; I am in peril; I am in peril in soul and in body. I am in Hell .... No one loves me in this house; all are very severe. No one speaks to me any more but Jesus, for Jesus is always with me. But if Signora Cecelia is afraid of the devil, what shall I say when I am all alone? Even now I feel myself destroyed, finished. Jesus.., Jesus! ... I am alone writing in the study of Signor Lorenzo. Oh Father. . . . Jesus, make me share in your sufferings. Let me suffer lovingly, suffer for you Jesus, and die suffering. What if I be deprived of Jesus? Oh Jesus, have I really lost Your grace? But even in the midst of so much unworthiness I love you so fervently!. I shall die, Jesus, if I die it shall be for the love of you. Father, I take courage; the smaller I feel myself to be, the more I feel the love of Jesus; His love inebriates me . . . even though Cecelia and the others do not love me. I remain alone; Father, do not leave me here alone. No one knows that I have written this letter. Poor Gemma! The love that her foster mother Cecilia, the Giannini’s and Monsignor Volpi had for her had been undermined by the machinations of the devil! Living with Cecilia and the Giannini’s, she came to feel herself a outcast and a burden in her own home. As we can see their lack of confidence and trust in her wounded her loving heart immensely. "Be assured that the letter which I have in my hands is not trickery. And be sure that soon light will be shed upon that one which is in Monsignor's hands. To Gemma, then, do not be reproachful; be with her again affectionate and loving. Believe that Jesus is in your house in her person. For now, tell her she is to refrain absolutely from writing to me (without, however, letting her know that I said it.) If she has something to say to me, let her tell me directly through her Angel or mine. If it is Jesus who has given you, Gemma, this humiliation, who are we to say, "Why have you done this?" I should be very much disturbed therefore, if dear Gemma is distressed about it. It would be a dreadful sign of pride. Oh, do we not merit worse for our sins and ingratitude and lack of correspondence? In regard to strength, if we are humble, Jesus will give us a great deal. Therefore, Gemma of Jesus is not to vilify herself, and also is to guard against saying or thinking that the confessor is mistaken or was mistaken. This also would be pride. Instead, humble yourself and say: "Behold the poor, miserable, ignorant, foolish, unworthy servant of God; do with me what is pleasing to You." Do you understand, Gemma? Do not reflect so much; do not indulge in so much recrimination, but suffer in silence, and with humility. For now, go to Father Vallini to confess or to whomsoever you are told. If the present tribulation increases, be firm as a rock. If the Giannini's should want to drive you from the house as a malicious person, it is not my wish that you go elsewhere. Your adopted mother, Cecelia, and I, your father, will stand by you. on, I will not abandon you, dear child; in all your sufferings you can count upon me. And then there is Jesus, the dear Spouse of our souls. Our dear Jesus of Gemma! And then there are the Angels. Our dear Angels! What could you do more than you are doing? My blessing at all times to you and to this dear girl. If I had weil reflected that humiliations are for Jesus the necessary path to glory, I would not have been so cast down by these happenings. Who will give me holy humility? And to think that every day I go to Holy Communion and unite myself to Jesus, the fount of humility. I am full of the wretchedness of pride. Jesus!, Jesus will give it to me, and also He will add to this all other virtues. Blessed be Jesus!" Having played his tricks with success on Monsignor Volpi, Cecelia, and the Giannini family, the devil turns his attention to Julia, Gemma's devoted sister whom she had left at her family home [Gemma was staying with the Giannini's at this time because she was orphaned due to the recent death of her father, and also her mother who died when she was 8 years old]. Julia, annoyed by all the unkind rumors concerning Gemma, pleads with her to return to their family home. The devil confuses the child and seems veritably to take possession of her, driving her to strange conduct, totally outside of Julia's normal character. Father, I received your letter about an hour ago; how many things happened Sunday! About half-past one Julia began weeping wishing at all costs for me to go home. She kept it up until evening, so that it was arranged by Cecelia for her to come to sleep here. Whenever anyone asked her why she wanted me to leave here, she replied that the Passionists had counseled her to do this. At other times she replied with strange words that only the devil could have suggested to her. I, at last, to frighten her, took the pen to write to you to tell you about these matters, and she took the pen from me and would not give it back. When I insisted that I was going to write to you, she screamed and seemed to be out of her head. Father, it was not my gentle Julia at all who was acting that way, so do not think ill of her. She is a good girl, and she did not act of her own free will. And strange to say, this happened just after your letter came yesterday. Immediately before she was calm and happy with me. Afterwards I recall her laughing at me in church in the morning. It was a very strange day. The devil is using Julia for his own purposes. How many times, Father, during the day, I heard these words in my ears: "War, war to your father, and to your souls!" And this is a cry that I have heard many times in the past day, many times ... Ought I to go home? If I should at the very first sign of illness they would run for the doctor. Father, Father! Signora Cecelia has almost yielded about sending me home. Monsignor says to wait to see what ought to be done. Oh Father, if you do not have a remedy at once, what will happen to me? Poor Jesus! The loss of my senses after Communion and when I am with Jesus becomes constantly more frequent [Here Gemma is referring to her ecstasies- editor] Father, what will become of me? Do something, soon before Monsignor returns Friday; because he will at once make me out of obedience go home to satisfy Julia. What shall I do? The devil wishes to conquer. Today I heard him laughing, and I heard it so clearly that it still rings in my ears. If I were in my own home Father, with the doctor, with a sister who has already told so much about my affair to people around, what would I do? Send for me to go away from here now; there is no longer any time. If it were not for this illness sent by Jesus I would make the sacrifice of leaving my dear Cecelia for the sake of obedience. Gemma did not return home and the devil having failed in this attempt, planned anew. Gemma tells us the devil is unchained and he intends to work havoc in the mind of the Provincial of the Passionists concerning Father Germano. "... And the devil, Father? How I fear him! For fifteen days I have not been to confession. Monsignor is away and returns the ninth of September; and I am in darkness. I sin constantly, and yet Jesus does not weary of me and still supports me. Father, the devil is unchained. Woe, to you, and to Father Provincial*. The Monsignor said he will act soon. If Jesus is satisfied, it matters little. About Monsignor, you will learn from Father Provincial . . . but I tell you again the devil is unchained. Would it not be better, Father, if you sent for me to come to live near you? Here what will happen to me? Everybody, together with the devil is against you and me. But Jesus, Jesus is with us. Bless me always. "As you already know from the Provincial how well the devil is served these days! Gemma is continually advised by Jesus to be on her guard. One day a letter came to Father Provincial wherein he was urged not to bother with Gemma any more, because he, the anonymous writer of the letter, had had enough light from Jesus to guide Gemma; that he abandon her and advise Father Germano also not to bother with her any more." 'As it will be impossible for me to see you before I leave, I would request you to have nothing to do in the foolish affair of Gemma as I have come to know from Jesus, that what has happened to her is entirely due to diabolic tricks. You should no longer interest yourself in her behalf, and should advise Father Germano to act in the same manner. If you both continue to help her, you will run the risk of causing her spiritual ruin. She does not need your assistance. I am myself sufficiently enlightened about her deceived soul. If she follows the counsels I have given her, she may yet find her way to God. Father Provincial didn’t pay any attention to this anonymous card; he told Gemma to continue writing her autobiography. Father Provencial put this anonymous card in an envelope to send to Father Germano, and he told Gemma to have it taken by the angel. Jesus said that from this card Gemma would have a thousand humiliations. "At about one o'clock yesterday, I received through my guardian angel the letter you wished to send me by post. I will reply at once. 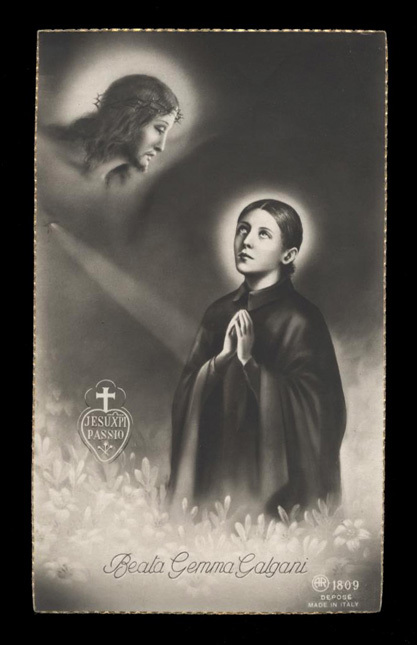 I wish, dear Father, we could do things twice .... Having prayed to our Venerable [St. Gabriel had not yet been canonized], he finally made me understand that Gemma is deceived. My dear Father, let us avoid further mistakes. We should not busy ourselves about the affairs of others lest we run the risk of eternal damnation. Undo all you have said about Gemma. It is useless even to try to unmask her. All that has happened to her is mere hypocrisy and deceit. She is within the power of the devil and all our efforts will be of no avail. Let us keep clear of this business. The esteem I had for her in the past, has now changed into hatred and disgust. I wish you could feel in the same way. For my part I shall never speak nor write again about that hypocrite. Yesterday's trick was of her own doing; she hid the letter which my angel picked up and brought to me. I am more concerned about Signora Cecilia. You had better warn her to send Gemma away from the house befor all its people are ruined forever. The Venerable Gabriel has dictated this letter. That other letter concealed in a drawer [presumably the one hidden between two holy pictures] was not brought by her angel, but Gemma herself sent it by post after stealing the money from the house. I have ceased to believe in any of these things. You may warn her once more, and then have nothing more to do with her affairs. It is necessary to inform the Gianninis about the warnings of our Venerable Gabriel in order that they may send her away. I might add much more, but I hope you have understood. The best course is to refer the matter to the Bishop and deprive her of Holy Communion." Whichever it may be, there was more trouble to come. One morning all the letters of Father Germano to Gemma, which were in the keeping of Cecilia, were found scattered all over the house. Who had done it? This event happening as it did, soon after the arrival of the suspicious postal card, the missing letter of Father Provincial, and of the phony letter supposedly from Fr. Germano to Father Provincial, cast a heavy cloud around our Saint. She became suspect and some of her loved ones began to doubt her sincerity. Unwilling definitely to lay the guilt upon her, the people of the house could not help feeling uneasy at all these disconcerting events. And this was exactly what the Devil wanted--to sow division between the Saint and her loved ones. For, as God brings unity and love, the Devil sows division and hatred, and this is why the word "Devil" literally means "divider". "Jesus is exposed on the altar. Please, Father, go and ask Him who has scattered all your letters to me about the house. I am under suspicion, but I don't think I have done it. Now, they all behave strangely toward me. ... Do you see it, Father? All your letters were found thrown here and there about the house .... Jesus will explain the matter to you. I spoke of it to my confessor [Monsignor Volpi] who assures me it is the devil. What then will he do next?" We see that since the enemy obtained some opposition with his phony cards and letters, he tried different stratgies, all in an effort to discredit Gemma and to sow division between her and her loved ones. First he put this letter in the room of Father Provincial, written apparently by Father Germano, which said that he was going to abandon Gemma at once; that he had had sufficient illumination from Venerable Gabriel to know that she was a hypocrite; and that he would tell Monsignor to keep her from going to Holy Communion; and that he would tell Monsignor to send her away from the house if Cecelia did not want to ruin twelve innocent souls. Then he scattered Fr. Germano's letters all over the house. Signora Cecelia tells of the efforts of the demon to discredit Gemma with everyone, even with her, but she assures Father Germano that she resists the temptation by running to Jesus in the Blessed Sacrament. She also says that she knows that she is unworthy to be the guardian of Gemma, that she loves her constantly more and more. “Yesterday evening I received two letters, one from you, the other from Gemma, both posted the 4th and carried first to Corneto and then to Isola, then again to Corneto and finally they came here. I have had no letter as yet from the Father Provincial. I have written to him once only when he was in Florence, but not of Lucca and not even mentioning you or Gemma. Thus it is proven that the evil one has written the two famous letters. And so Satans evil campaign to malign and discredit Gemma ended with Father Germano, Cecilia, and the rest of the Giannini family siding and believing in Gemma, while Monsignor Volpi remained somewhat doubtful concerning Gemma. And the devils diabolical attempts to dupe the Provincial of the Passionists and to snare her Spiritual Director, Father Germano were not successful. He did, however, by his interference, force Father Germano to be restrained in his relations from then on with Gemma. This restraint in relations with Father Germano proved a greater trial than the estrangement of Monsignor Volpi. So, at lest in this way the Devil succeeded in his evil workings against the Saint. The differences that arose between Monsignor Volpi and Father Germano because of the machinations of the evil one can be readily understood. The viewpoint of the Monsignor was that of a conservative churchman. That of Father Germano was that of an astute Spiritual Director, who was well known and sought after throughout Rome,and the surrounding territories for his spiritual direction, and who was very well versed in the teachings of Mystical Theology. In fact, Pope Pius X recognised and appreciated Father Germano's mystical knowledge, as he stated in a letter written by his secreatry after his reading of Father Germano's biography of Gemma. In the end, the results of this combination of circumstances was not surprising. Gemma's health became alarmingly worse, but her love and reliance upon God grew. Through this painful trial and stripping, Gemma learned to put her complete trust in God, who is to be loved above all others, and to detach herself from creatures, putting her faith and trust in God alone, and not in poor humanity who is always frail. While these underhanded tactics of satan against Gemma where definitely bad, I think the physical attacks that he waged against her were in some ways worse. As related elsewhere on this website and in Father Germanus book on St Gemma, the demon tore her arm out of socket, beat her relentlessly, and dragged her by the hair around her bedroom. He waged a hellish war against her, both physically and mentally, and also in her relations with her family and friends as stated in this article. But, with the help of her beloved Jesus and Mary she triumphed in the end. Her life and love for God is truly inspiring. At least in one case however the "liar" and "deciever" actually kept to his word when he forewarned Gemma saying: "do as you wish for yourself, but do nothing for the conversion of sinners, for if you do I will make you pay dearly for it". And for her reply she was overheard to say to Our Lord in ecstasy: "Do You wish to know, Jesus, who has forbidden me to think about sinners? The devil. On the contrary, Jesus, I recommend them to Thee. Think of them, oh Jesus, all poor sinners, and teach me to do as much as possible to save them."